Home • News & Events • News • RAMW Blog • DC Businesses: Get Five Shifts Free with Snag Work! DC Businesses: Get Five Shifts Free with Snag Work! 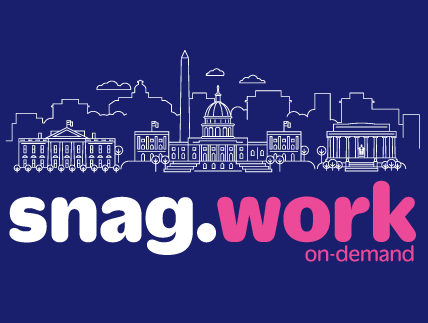 Snag Work, Snag’s flexible work platform, is excited to launch in the nation’s capital! By instantly connecting workers with open shifts in restaurants, hotels and retail storefronts, Snag Work gives workers the hours and flexibility they need to live more fulfilling lives. Simultaneously, we help businesses eliminate headaches related to turnover, callouts and surges in demand. Snag Work gives everyone more flexibility, transparency and control. We are actively recruiting top-notch workers and businesses to join our D.C. team, and we can’t wait to work with you. That’s why we are offering the first 50 businesses who sign up in D.C. five shifts for free. What is Snag Work and how does it work? Workers create profiles and set their availability. We vet every worker on our platform, and since we are fully insured, we minimize employers’ policy risks: no overtime, ACA or workers’ comp to balance. Businesses post open shifts, and our algorithm matches you with the right worker. Once the worker accepts the shift, you’re good to go. Pricing is simple. Snag charges employers a consistent service fee as a percentage on top of worker wages. No upfront commitments. The final line: you request a shift. A qualified worker accepts the shift. You both get what you need. The result: More shifts filled by top notch workers at quality brands. Here is the data to prove it. Get back to the important things like managing your business and keeping your customers happy.